Item Description: “Along the Line of the Railroad” (editorial), The Daily Journal (Wilmington, N. C.), 11 June 1864. WILMINGTON, N. C., SATURDAY, JUNE 11, 1864. 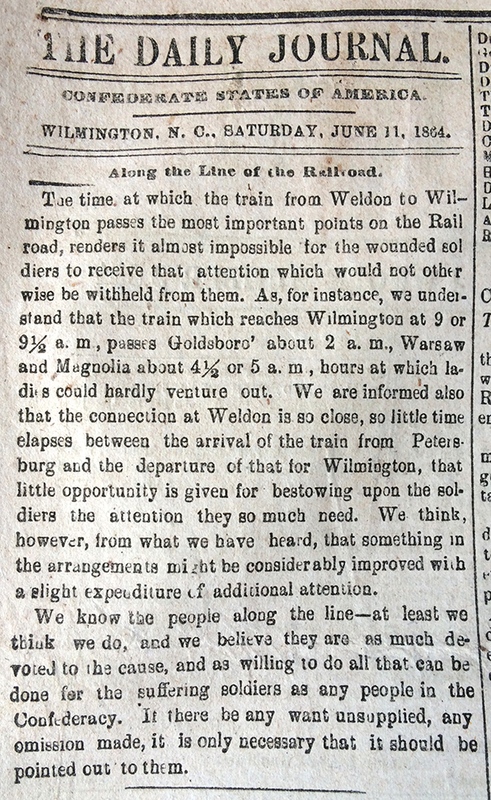 The time at which the train from Weldon to Wilmington passes the most important points on the Railroad, renders it almost impossible tor the wounded soldiers to receive that attention which would not other wise be withheld from them. As, for instance, we understand that the train which reaches Wilmington at 9 or 9 1/2 a. m , passes Goldsboro’ about 2 a. m., Warsaw and Magnolia about 4 1/2 or 5 a. m , hours at which ladies could hardly venture out. We are informed also that the connection at Weldon is so close, so little time elapses between the arrival of the train from Petersburg and the departure of that for Wilmington, that little opportunity is given for bestowing upon the soldiers the attention they so much need. We think, however, from what we have heard, that something in the arrangements might be considerably improved with a slight expenditure of additional attention. We know the people along the line—at least we think we do, and we believe they are as much devoted to the cause, and as willing to do all that can be done for the suffering soldiers as any people in the Confederacy. If there be any want unsupplied, any omission made, it is only necessary that it should be pointed out to them. Item Citation: editorial, The Daily Journal (Wilmington, N.C.), 11 June 1864, page 2, column 1. Call number C071 Z, North Carolina Collection, Wilson Library, University of North Carolina at Chapel Hill. This entry was posted in North Carolina Collection and tagged soldier conditions, Wilmington (N.C.) Daily Journal, Wilmington and Weldon Railroad, wounded soldiers. Bookmark the permalink.